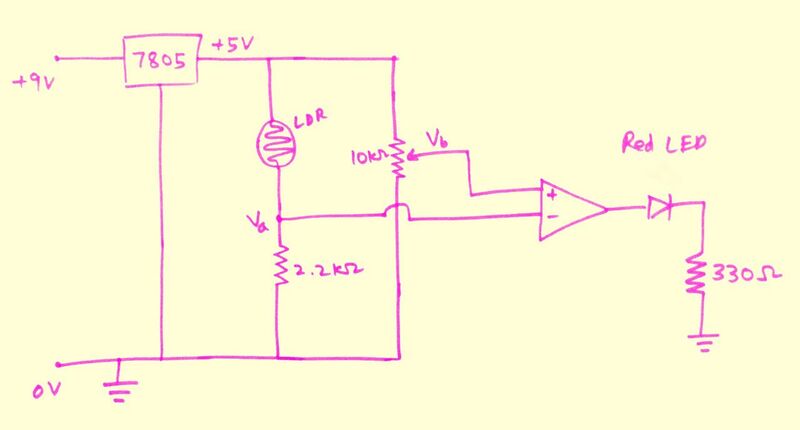 This 4th article in the series of “Do It Yourself: Electronics”, takes you through using a bipolar junction transistor (BJT), as an electronic switch. “Hey! Shut up yaar. Where did she come in between? I was thinking of how to use the transistors in a practical way”, replied Pugs showing anger. Both Surya and Pugs walks down to Pugs’ room. Pugs took out the transistors, trying to check the number written on them. “O! That’s great – you know quite a bit about them. Hmmm! I see the effect of the class”, said Surya staring at Pugs. This entry was posted in Electronics and tagged basic electronics, basic electronics tutorial, Battery, Bipolar Junction Transistor, BJT, BJT as an Electronic Switch, Breadboard, build your water level indicator, building electronic circuit, DIY, Do It Yourself, Electronic Circuits, Electronics, electronics water level indicator, home made water level indicator, how to build a water level indicator, LED, Light Emitting Diode, making a water level indicator, Resistor, simple electronic circuits, water level indicator, Wire on May 1, 2015 by Anil Kumar Pugalia. This 3rd article in the series of “Do It Yourself: Electronics”, takes you through the basics of infra red sensing using an IR LED and an IR diode. Early morning, Pugs went to the ECE Department to meet Surya, who was creating some experiments for his juniors. “What are you doing at this time in your department lab?”, exclaimed Pugs to Surya. “To me it seems like another light sensor. Sun also emits IR. So, may be we can detect presence of sun”, interrupted Pugs. “Why only sun? Even our bodies are good source of IR”, added Surya. Pugs went to his room & rebuilt the circuit. But to his surprise, the LED was always on. He tried debugging it, as in his previous light sensing circuit, but in vain. So, in frustration, he called up Surya and said, “Surya, your debugging gyaan is not working out. 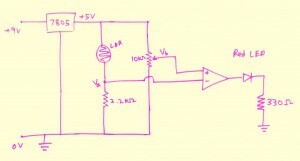 I tried all your suggested debugging tricks, but not able to figure out the problem in my circuit”. “What happened? Have you powered up your circuit?”, queried Surya. “Yes obviously. And that’s what the problem is. In my circuit, the LED is now always powered on”, replied Pugs with a sarcastic voice. “Where have you put the circuit?”, asked Surya. “Just try it, na”, emphasized Surya. So, unwillingly Pugs put his circuit below the table, and viola the LED went off. And then, when he hovered his hand over the circuit, the LED switched on. He couldn’t believe himself. So, he tried the same multiple times. Then, he also put back the circuit on the table to check the problem, again. And yes, it was there. But all fine, when below the table. “What happened Pugs? Did it work?”, asked Surya, as he didn’t receive any response from Pugs for a while. “What’s that?”, asked Pugs curiously. This entry was posted in Electronics and tagged basic electronics, basic electronics tutorial, Battery, Breadboard, build your own infrared sensor, building electronic circuit, DIY, Do It Yourself, Electronic Circuits, Electronics, electronics sensors, home made infra red sensor, how to build an infra red sensor, Infra Red Diode, Infra Red LED, Infra Red Receiver, Infra Red Transmitter, infrared sensor, IR Diode, IR LED, IR Rx, IR Tx, LED, Light Emitting Diode, making a sensor, Opamp, Pot, Potentiometer, Resistor, simple electronic circuits, Wire on April 1, 2015 by Anil Kumar Pugalia. This is all about “Do It Yourself: Electronics”, as how it started between two college friends from NIT Warangal. “Oh! It was a total tangential lecture today”, sighed Pugs in the cafeteria. “Why? What happened Pugs? What was it about?”, asked Surya. “Electronics Fundamentals, yaar”, replied Pugs. “But, why in this world have you chosen that elective, you being a comps guy?”, asked Surya with curiosity. “O really! And what is this top-down approach”, exclaimed Pugs. “What I mean is that you should first start playing with the various electronics components, understand their practical usages by designing simple breadboard circuits. And, then go into the gory details, if necessary”, explained Surya. “Hey! No yaar. It is just for you”, Surya replied shyly, thinking of the public exposure. Pugs was all excited after this first level of kick-starter by Surya, and requested Surya to show the video on resistor colour coding, as well. “That was really simple. Something like the ‘Hello World’ program we write, when we start learning a programming language”, expressed Pugs. “Exactly, that’s what it is in the electronics world – blinking an LED”, confirmed Surya. This entry was posted in Electronics and tagged basic electronics, basic electronics tutorial, Battery, Breadboard, build your own led circuit, building electronic circuit, Capacitor, Diode, DIY, Do It Yourself, Electronic Circuits, Electronics, home made led circuit, how to build an led circuit, IC, Integrated Circuit, LED, led circuit, Light Emitting Diode, making an led circuit, Pot, Potentiometer, Resistor, Seven Segment Display, simple electronic circuits, SSD, Switch, Transistor, using a digital multimeter, using a dmm, using a multimeter, Wire on February 1, 2015 by Anil Kumar Pugalia.